A few weeks ago my company had an internal conference called “The Fiserv Leaders Conference on Testing” and I, along with some others, was tapped to do a talk on Agile and testing. We decided to write down what we feel are the principles of Agile testing (similar to the principles laid down in the Agile Manifesto). This isn’t what we ended up with, but this is my list and thus I will record it here. Before I do, I should acknowledge this isn’t a new endeavor. Others have done this before. I particularly like this one from Karen Greaves and Sam Laing. And I’ve certainly borrowed from these ideas in coming up with this stuff below. I don’t think it breaks any ground, but this is where my head is currently at, and how I frame testing in my current organization. Everyone is responsible for quality. When a story, or work item, is marked done, that means the team is agreeing that the work is done — the whole team, not just the testers. Everyone is accountable for it, thus everyone should be involved in testing. Anyone on the team can take on the “role” of tester, just as anyone on the team can program, or write a story. Working together is the best way to get the best quality work done. Agile works primarily because of its built-in feedback loops that happen much more often than in waterfall or even in earlier iterative frameworks (Spiral, RUP). 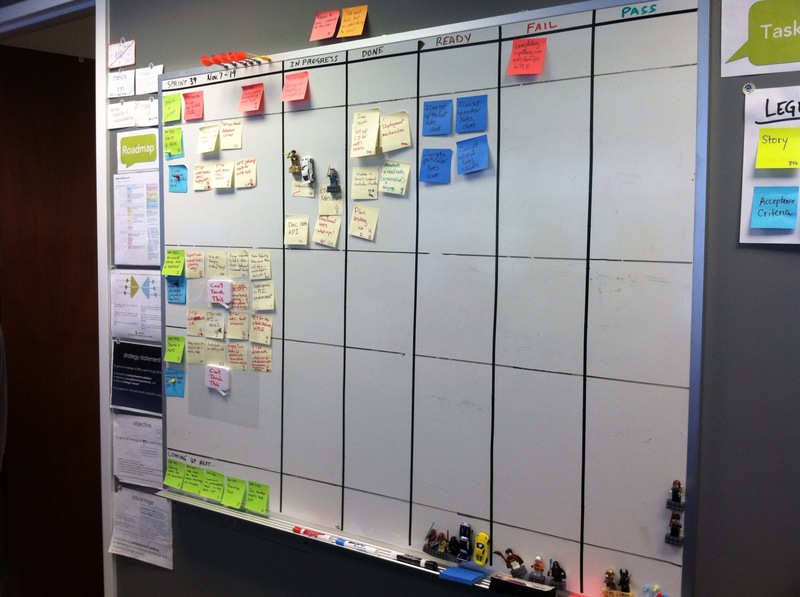 Scrum, for instance, has daily feedback via the daily Scrum. 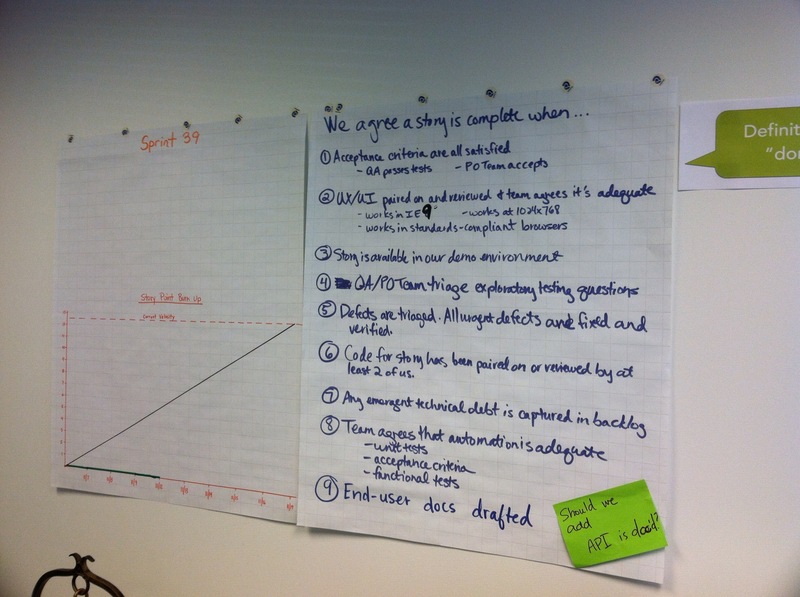 Then there’s feedback at every sprint boundary with the Review, Retrospective and Sprint Planning. And beyond that Release planning. When you include XP, and other common agile testing practices you create even more feedback loops on top of these. The Agile Testing Quadrants model expresses that quite well (and perhaps this does it even better). One thing to note is that “checkpoints”, “milestones” – things like that are NOT feedback. Those checks come too late (by definition). So, for example, organization mandated Control gates like sign offs, Pen testing, or Performance testing that must occur before a product is released are not valuable sources of feedback. They occur too late for us to react. Failures at these points almost always result in delays and overruns which decreases value. Check out this prezi for illustration. Changing the way you write tests to suit the needs of the team. Testers are not the assurers of quality (and honestly they never were). Testers provide information about how the product does, or doesn’t behave. And that is valuable! So provide that. Update stories with information about system behaviour. Be proactive with updates to the product owner. Continuously work with programmers to match up expectations with reality. Communicate with other teams and stakeholders who have questions about the system. And above all, have the courage to provide that information even if you think it won’t be well received! When providing information, or writing tests, or executing tests, make it as simple as possible. Complexity is the enemy of information and should be avoided. When communicating about the system, don’t hide behind misleading metrics or test documentation that nobody reads. CYA is not a key tenet of Agile! When writing a test, remove useless or obfuscating information. For example, you shouldn’t need exhaustive steps – you are part of a team that knows your software. You’re no longer throwing it over a wall to a test team that has no experience or familiarity with the product. Execution should be as simple as possible. Most testing does not need to be integrated across services, products and platforms! You are usually testing a single behaviour within the confines of your system. If so, then make sure that’s exactly what you test – use test doubles (mocks, shims, stubs, etc.) as often as possible. Use tools or automation to make execution easier and faster if warranted. If automating, make it obvious what you are checking – name checks properly and make it easy to see the result matches the expectation. Design systems with testability in mind – make it easy (or at least possible!) to test the individual parts of the system. When you first walk into the building you see a conference room and a couple of offices. Our guide, Steve Paro, was quick to point out that there are few offices (in fact I only saw 3) and almost everyone works in team areas. Marketing and Sales are off to the left in a rather cramped series of rooms with shared “open-plan” style workstations with large visible charts on various boards, walls and dividers that appeared to split the groups in somewhat meaningful ways. Steve let us know that while all groups use some form of agile to do their work Marketing’s is closest to “pure” Scrum. The rumpus room is the main recreational area and doubles as the location for company meetings. A backtrack and another left turn takes us to a walkway overlooking an unexpected large open area on the ground floor. We took the stairs down to the “rumpus room” (pictured at left) which is the main recreational area and also doubles as location for company meetings. (In my time there the pool and ping-pong tables saw heavy use, which led to a key takeaway about organization culture, but more on that later.) You can’t see it in the picture, but off to the left in a little corner is a working, full kegerator. Just past this area is where the development work is done. The group is broken up into several teams, each focusing on an aspect of the product, like Core, Analytics, and APIs. Each team has an open style work area with pairing stations. All coding is done pair-programming style and each team has at least one pair with the largest having three pairs. As people are added or switched between teams it’s always two at a time. Which leads to the question of stable teams, which is a good agile practice that the company has been adamant about maintaining. The development area features open-style work benches with pair programming stations. But they’ve discovered over time that not having structure around how people move between teams was causing problems. Some people felt stuck on teams and it was hurting morale. 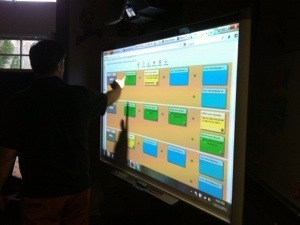 In the current model, everyone moves to another team and everyone switches pairs on a set schedule. In this way, nobody feels stuck, but at the same time there’s not large upheaval that would hurt the ability of each team to keep its established cadence. The policy isn’t interesting so much as the process in this case. The key is they had an existing policy, they observed problems related to it, so they changed the policy, adapting it over time until they found something that worked. And that in turn may change as conditions change. Here’s a question to ask about your own organization – do employees have to adjust the way they want to work to adhere to policies or are policies created to help employees work the way they want? Another relatively recent change at VersionOne (both in the company and in the product) is their adoption of the three-tiered scaled agile model that is becoming more and more popular for enterprise adoptions. There’s a Business team that is focused on new business goals and market strategies. There’s a Product, or Feature team that focuses on defining features that will meet those goals, and then there’s the development or Delivery team that does the work. In this case, the product owners of each team work together (in fact, in the picture to the right above, the prominent work area on the right is the Product Owner team), with input from the teams, on creating features and stories for the various project teams. And this collaboration appeared to be important – the term “three amigos” was used several times. Another way they enforce collaboration is through collective code ownership – anyone can edit anyone else’s code. Shared documentation is managed using a Confluence wiki and HipChat is the tool of choice for distributed chat communications. 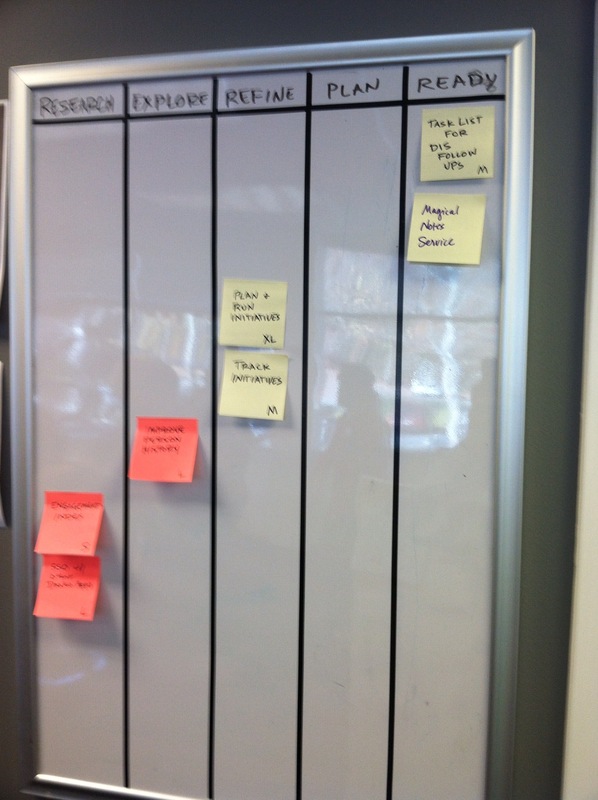 A view of the status of stories being worked on. Walking through the development area and to the left is an area dominated by a giant whiteboard that doubles as a touchscreen. 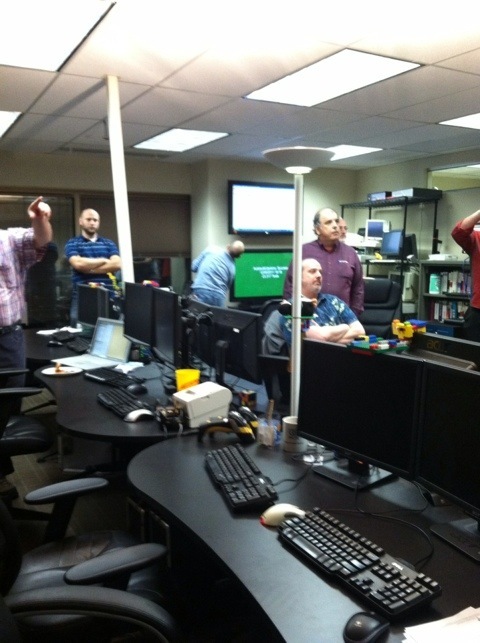 This is where the teams have their standups and where stories and features are managed throughout the release cycles. VersionOne has quarterly release cycles, not because that’s the only time they have product ready to release, but rather because over time based on customer feedback, they’ve come to realize that enterprises can’t consume changes very quickly (which suggests an interesting question for another day). Steve described their development methodology as ‘Frankenagile.” It’s a sort of Scrumban with elements of eXtreme Programming and their own wrinkles. Their process is managed, in true dogfooding fashion, by the VersionOne tool (it turns out they use the same release as their customers, only updating shortly before actual release). Iterations are one week, but the work flow is much more Kanban-style in that the concern isn’t that all work is done in a given iteration but rather that a sustainable pace of completed work is maintained. The key metric here is stories completed. Based on this metric they can predict with reasonable certainty how much work they can complete within a given release cycle and thus what features should be slated for a given release. This view shows the status of builds for each project team. 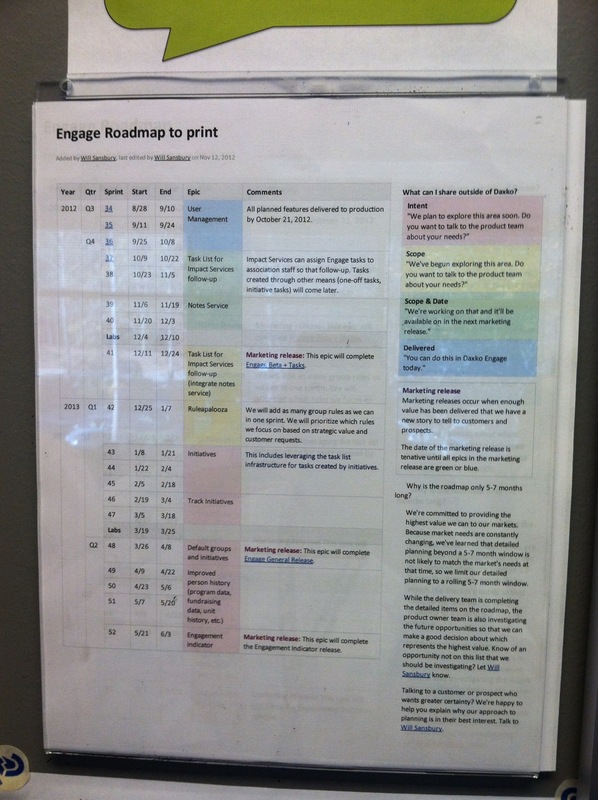 The teams have three sizes for stories – 1/2, 1 and 2 with the vast majority being 1 point stories. I asked, since there is great importance on uniform-sized stories in this model, how do the teams manage to create them independently? The answer is that they’ve just naturally come to that over time. They’ve been doing it for so long that they just seem to create right-sized stories organically without any specific rules or process (planning poker cards were abandoned long ago). They do have dedicated iterations for burning down technical debt which roughly works out to about 20% of the time for a given release. Additionally, some developers are assigned to handling support calls should they arise, this duty is also rotated over time. Continuous integration is an important part of the process. They use Jenkins to manage the builds for each team, tracking both checkin and nightly test runs which comprise both unit, and acceptance tests. They are currently iterating through the use of cucumber to create scenario tests. Steve reports that they haven’t had much success at using the tests as “living documentation” but they have seen value in the collaboration it fosters in helping refine stories. A screen showing the high-level features planned for the next release. I asked about UI automation, and they do have some, but mostly used for high level scenario and process flow checks. After a recent STPCon, the lone dedicated tester of the group discovered the glories of Session-Based Testing. This method of managing Exploratory Testing is quickly being adopted by the teams. Back in the rumpus room, Ian Culling took over and gave a short presentation describing the importance of culture in the organization. When they hire, they look for craftsmen, people that care deeply about the work they produce and are intrinsically motivated to “do the right thing.” He made comment here that resonated with me about Minimally Marketable Features (MMFs). He said they don’t equate to “just getting the job done,” they have to be right; these are features upon which your software is judged by users. It’s a key point about how sometimes commonly used terms can take the focus away from what really needs to be done. Ian Culling talks about the importance of culture at VersionOne. They also look for anti-establishment types that won’t be readily cowed by corporate edict. He told a great story about guerrilla coffee makers that I won’t repeat here, but suffice to say employees are empowered to change their environment, even if it involves company money, to make their work more effective. To judge whether an individual will fit well in the organization, a candidate actually works with the team for up to a day, and anyone on the team can veto the hire. Earlier I commented about the recreational equipment — if you have these things does anyone/everyone use them? If not, why not? Is it because they fear to use them because of judgement from management, or even other coworkers? If these questions make you the least bit defensive, you might have a culture issue. 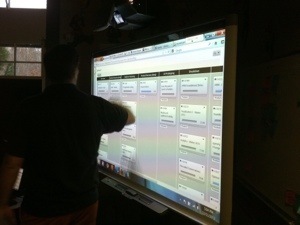 Overall they strive to create a culture of reflection and experimentation. They of course encourage regular retrospectives on the teams, but also foster experimentation in other ways. One is by sponsoring a “hack week” where employees work on whatever they want. 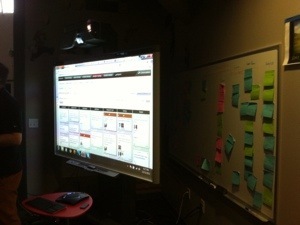 Some of the features in the product, including the new “Team Room” feature, are a direct result of this initiative. They also have a Makerbot. I hold a weekly meeting to discuss all things quality and iterative development. This week, we tried to define Productivity. We came to the conclusion that the way we want to measure productivity in the software world is different than in the manufacturing world. People aren’t machines or even assembly lines. Simply being “up and running” doesn’t mean we are being productive. One common example is the manager walking around to see if people are surfing the Internet instead of being “productive.” Someone shared an anecdote of a dishwasher that finished early, but rather than incur the wrath of the boss for sitting around doing nothing decided to dirty up the dishes and wash them again. That’s not the kind of behavior we want to encourage. It’s not fungible , i.e. points aren’t transferrable between teams or across projects. So if team A has a 20 point velocity and team B has a 40 point velocity it doesn’t mean B is 2x productive as A. In fact, it doesn’t even mean they are *more* productive. Once you start rating a team on productivity based on points, guess what? The team will start showing a dramatic increase in Velocity! So what’s a better measure? You could simple count the number of actual stories you output over time. That could work, but it’s also susceptible to gaming. (Although, something that encourages lowering story size is probably a good feedback loop to employ!) Cycle time is also a metric you might use. This measures the time from when a story gets into the iteration to when it is marked Done. If your average cycle time is longer than a normal iteration, well that’s an indication of low productivity! None of these are perfect. That’s why it’s also a bad idea to rely on one metric. Use a combination of tools to focus on areas of concern and improve them. If velocity is going up, but cycle time is staying the same, there may be some problems with story estimation – maybe one voice has started to dominate the process. If output is up, but velocity is down, there may be a problem with prioritization (we’re only working on easy stories). We also discussed Throughput as a concept, being the result of Sales – Cost of Raw Materials and then Productivity = Throughput/Operating Costs. This comes from Throughput Accounting and it isn’t often used in a software context. I think it’s fine to couch Productivity in terms of $; it’s certainly fungible. However, again, software generally isn’t sold in units that can be created many times a day! You’ll need to figure out productivity during the project in some fashion before it even gets put into active use. Still, this is all the more reason to have small features that can be put into use as soon as possible. 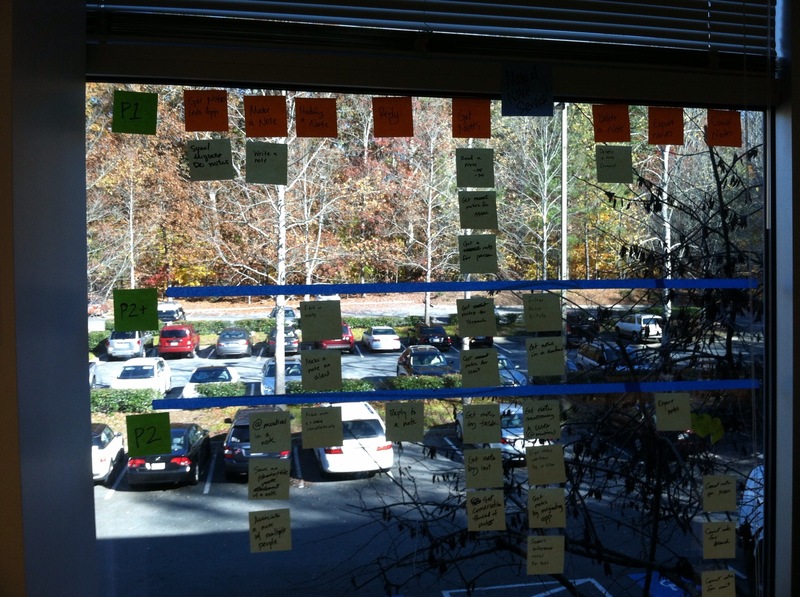 Through the wonderful Agile Atlanta, I got to visit another company’s location this week – Allure Global. They make dynamic signage for movie theaters – concessions and ticketing, etc. They are an Extreme Programming shop, which means they use the XP practices like TDD, collective code ownership, and others. They have two week iterations. They code in Java and use Jira as their project management tool. I took a couple of pictures. 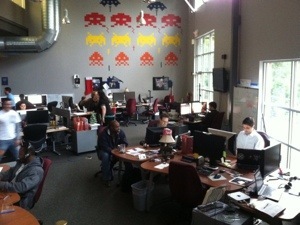 This first picture of the workspace for one of their delivery teams. Note the monitors side by side at each station. That’s because they do pair programming, another of the XP practices. When they come in to work, the team members pair up and start working on the days tasks. They don’t keep the same pairs and anyone can sit at any workstation – all of the code is shared and can be worked on by anyone. Checkins are signed by both members of the pair. 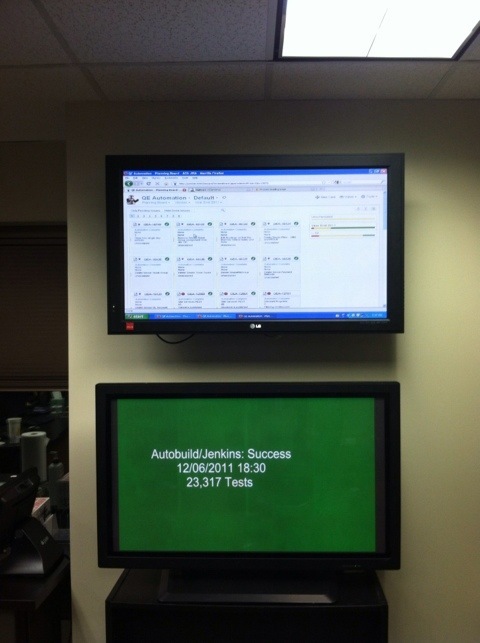 The second picture shows their dashboard and the status of their continuous integration. They use Jenkins to manage the automatic build, test and deployment of code. The bottom screen is green because the build for that evening was successful. You can also see the number of tests (or checks) that were run. Those are the tests that run as part of the build and they run FAST. All 20 some-odd-thousand of those tests run in a matter of seconds. These tests use mocks and other test doubles which allow them to run fast, but also to check only the specific code addressed. Having a fast-running, comprehensive suite like that makes it so much easier to refactor and redesign because you’ll get immediate feedback if you’ve broken anything else in the process. It’s a great feeling! The top screen shows the status of the automated functional and/or Acceptance tests – see zone two of the testing quadrants! These tests are more integrated and (as a result) slow and work at the story/feature level and are of more interest to the customer/product owner. The top screen also rotates to other information radiators important to the team, like a burndown chart. Much thanks to the friendly folks at Allure Global for sharing their environment and processes with me!